Even before Islaam was introduced to Yathrib, Rumaysa was known for her excellent character, the power of her intellect and her independent attitude of mind. She was known by various names including Rumaysa and Ghumaysa, but these were possibly nicknames. One historian says that her real name was Sahlah but later she was popularly known as Umm Sulaym. Umm Sulaym was first married to Malik ibn an-Nadhr and her son by this marriage was the famous Anas ibn Malik, one of the great companions of the Prophet. Umm Sulaym was one of the first women of Yathrib to accept Islaam. She was influenced by the refined, dedicated and persuasive Mus'ab ibn 'Umayr who was sent out as the first missionary or ambassador of Islaam by the noble Prophet. This was after the first pledge of 'Aqabah. Twelve men of Yathrib had gone to 'Aqabah on the outskirts of Makkah to pledge loyalty to the Prophet. This was the first major break through for the mission of the Prophet for many years. Umm Sulaym's decision to accept Islaam was made without the knowledge or consent of her husband, Malik ibn an-Nadhr. He was absent from Yathrib at the time and when he returned he felt some change had come over his household and asked his wife: "Have you be en rejuvenated?" Malik was not pleased especially when his wife went on to announce her acceptance of Islaam in public and instruct her son Anas in the teachings and practice of the new faith. She taught him to say laa ilaaha illaa Allah and ash hadu anna Muhammada-r Rasulullah. The young Anas repeated this simple but profound declaration of faith clearly and emphatically. Umm Sulaym's husband was now furious. He shouted at her: "Don't corrupt my son." "I am not corrupting him," she replied firmly. When it was known that Umm Sulaym had become a widow, one man, Zayd ibn Sahl, known as Aboo Talhah, resolved to become engaged to her before anyone else did. He was rather confident that Umm Sulaym would not pass him over for another. He was after all a strong and virile person who was quite rich and who possessed an imposing house that was much admired. He was an accomplished horseman and a skilful archer and, moreover, he belonged to the same clan as Umm Sulaym, the Banu Najjaar. Aboo Talhah proceeded to Umm Sulaym's house. On the way he recalled that she had been influenced by the preaching of Mus'ab ibn Umayr and had become a Muslim. "So what?" he said to himself. "Was not her husband who died a firm adherent of the old religion and was he not opposed to Muhammad and his mission?" Aboo Talhah reached Umm Sulaym's house. He asked and was given permission to enter. Her son Anas was present. Aboo Talhah explained why he had come and asked for her hand in marriage. "A man like you, Aboo Talhah," she said, "is not (easily) turned away. But I shall never marry you while you are a kaafir, an unbeliever." she asked somewhat taken aback and in a slightly censuring tone. "Yes," he said. "I swear to you, Abu Talhah, and I swear to God and His Messenger that if you accept Islaam, I shall be pleased to accept you as a husband, without any gold or silver. I shall consider your acceptance of Islaam as my mahr." "Don't you know Aboo Talhah, that the god you worship besides Allah grew from the earth?" "Don't you feel stupid while worshipping part of a tree while you use the rest of it for fuel to bake bread or warm yourself? (If you should give up these foolish beliefs and practices) and become a Muslim, Abu Talhah, I shall be pleased to accept you as a husband and I would not want from you any sadaqah apart from your acceptance of Islaam." "Who shall instruct me in Islaam?" asked Aboo Talhah. Aboo Talhah left and reflected deeply on what Umm Sulaym had said. He came back to her beaming with happiness. "We have never yet heard of a mahr that was more valuable and precious than that of Umm Sulaym for she made Islaam her mahr." Umm Sulaym was pleased and delighted with her new husband who placed his unique energies and talents in the service of Islaam. He was one of the seventy three men who swore allegiance to the Prophet at the second Pledge of 'Aqabah. With him, according to one report, was his wife Umm Sulaym. Two other women, the celebrated Nusaybah bint Ka'b and Asma bint 'Amr witnessed 'Aqabah and took the oath of allegiance to the Prophet. Abu Talhah and Umm Sulaym had an exemplary Muslim family life, devoted to the Prophet and the service of Muslims and Islaam. The Prophet used to visit their home. Sometimes when the time of Prayer came, he would pray on a mat provided by Umm Sulaym. Sometimes also he would have a siesta in their house and, as he slept, she would wipe the perspiration from his forehead. Once when the Prophet awoke from his siesta, he asked: "Umm Sulaym, what are you doing?" "I am taking these (drops of perspiration) as a barakah (blessing) which comes from you," she replied. At another time, the Prophet went to their house and Umm Sulaym offered him dates and butterfat but he did not have any of it because he was fasting. Occasionally, she would send her son Anas with bags of dates to his house. It was noticed that the Prophet, peace be on him, had a special compassion for Umm Sulaym and her family and when asked about it, he replied: "Her brother was killed beside me." Umm Sulaym also had a well-known sister, Umm Haram, the wife of the imposing 'Ubaadah ibn as-Samit. She died at sea during a naval expedition and was buried in Cyprus. Umm Sulaym's husband, Aboo Talhah, also died while he was on a naval expedition during the time of the third Caliph, 'Uthman, and was buried at sea. 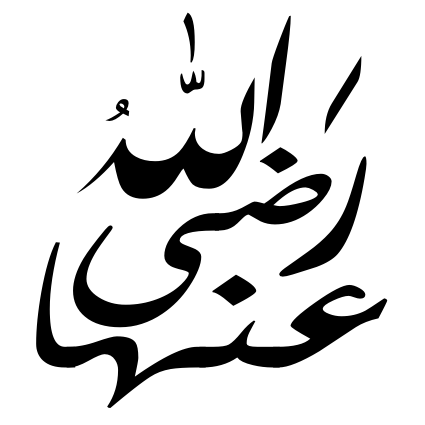 "May God grant you satisfaction in that," replied the Prophet. In the face of adversity, Umm Sulaym displayed a unique calmness and strength. One of her young sons (Umayr) fell sick and died while her husband was away looking after his orchards. She bathed the child and wrapped him in shrouds. She told others at her home that they should not inform Aboo Talhah because she herself wanted to tell him. Umm Sulaym had another son whose name was Abdullah. A few days after she gave birth, she sent Anas with the baby and a bag of dates to the Prophet. The Prophet placed the baby on his lap. He crushed the dates in his mouth and put some in the baby's mouth. The baby sucked the dates with relish and the Prophet said: "The Ansaar are only fond of dates." 'Abdullah eventually grew up and had seven children all of whom memorized the Qur'aan. Umm Sulaym was a model Muslim, a model wife and mother. Her belief in God was strong and uncompromising. She was not prepared to endanger her faith and the upbringing of her children for wealth and luxury, however abundant and tempting.